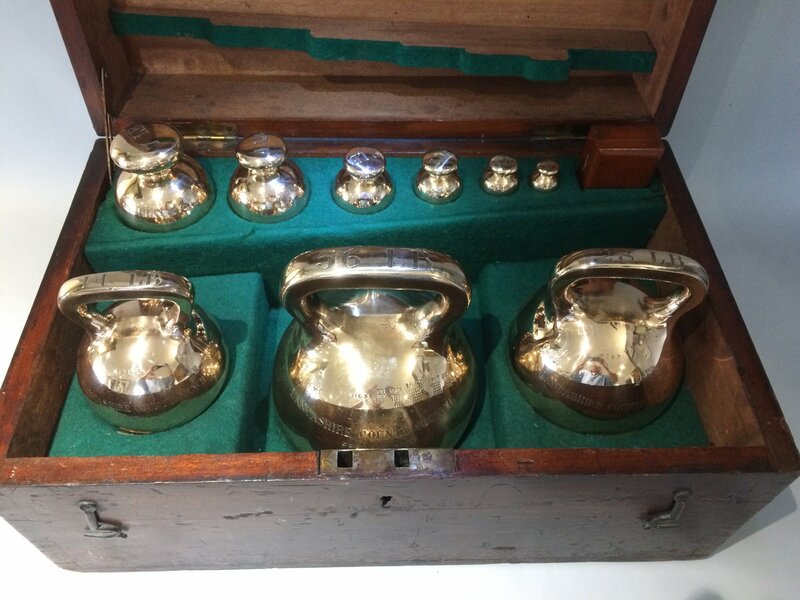 A RARE SET OF SPHERICAL WEIGHTS FOR LANCASHIRE COUNTY COUNCIL, Prescot Division, RETAINED IN THEIR ORIGINAL OAK CARRYING BOX AND WITH A RARE SMALL BOX FOR THE SMALLER WEIGHTS. CIRCA 1900. Comprising: 56lb, 28lb, 14lb, 7lb, 4lb, 2lb, 1lb, 8oz, 4oz in the main box and in the smaller box: 2oz, 1oz, 8dram, 4dram, 2dram, 1dram, and half dram.